5 Bedroom Flat For Sale in Arrochar for Fixed Price £180,000. 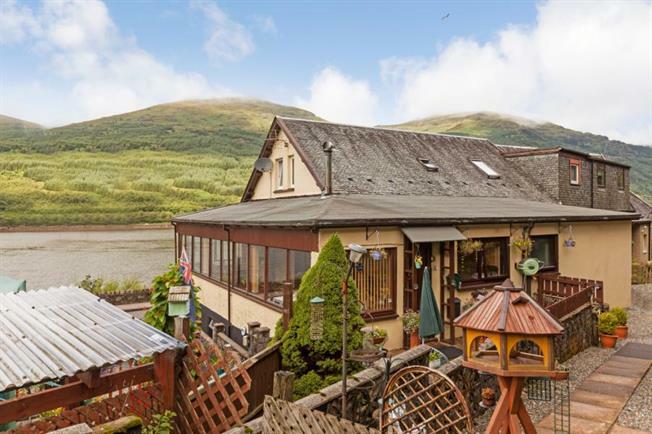 With views over Loch Long and beyond to the Arrochar Alps and The Cobbler this large 5 bedroom apartment offers spacious and flexible accommodation which could lend itself to a B&B business or large family home. A driveway leads up to the property and provides a level entrance into the conservatory/family room with it's dual-fuel stove and those amazing views; Central hallway giving access to all accommodation with a staircase leading to the master bedroom; Good sized lounge faces out over the loch towards The Cobbler; Fitted kitchen with integrated electric hob, oven, cooker hood, dishwasher and fridge/freezer; There are 4 bedroom on this level with two bedrooms enjoying the same views as the lounge; 4 piece bathroom with WC, WHB, bath and separate shower cubicle. The master bedroom is situated within the attic conversion and offers a very large bedroom with twin 'Velux' style windows viewing towards The Cobbler and one to the rear, off the bedroom lies a good sized dressing room with window; A three piece en-suite bathroom lies off the bedroom. The subjects are enhanced by double glazing and a dual-fuel stove which supplements the electric heating. A stone-chip driveway leads up from the main road to the private & ample parking area. There is also a paved storage area leading from this. A wrought-iron gate leads to a large decked area (and the property entrance) where one can sit enjoying those fantastic views. Steps lead down through the low maintenance landscaped garden to a further area where there is private parking for two cars.